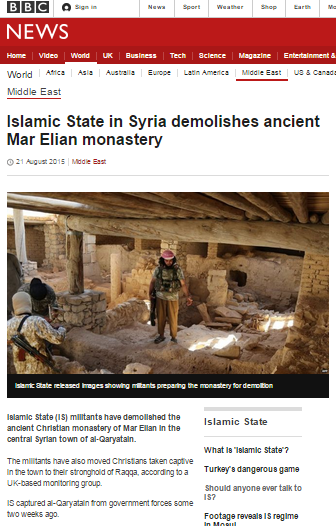 BBC audiences might reasonably expect an article carrying the headline “Islamic State in Syria demolishes ancient Mar Elian monastery” to inform them about the wanton destruction of a 1,500 year-old historic religious building. However, a significant proportion of the report appearing under that title on the BBC News website’s Middle East page on August 21st actually dealt with another topic altogether; curiously described as “a separate development”. The article has undergone numerous changes since its initial appearance which can be viewed here. All four versions, however, devote over a third of their word count to the topic of an Israeli strike on the Palestinian Islamic Jihad terrorists responsible for the missile attacks on the Upper Galilee region on August 20th. The original article devoted 36.8% of its word count to that “separate development”, the second version 48.4%, the third version 47.3% and in the version currently available, 34% of the article is not about the destruction of the Mar Elian monastery. “In a separate development, at least five people have died in an Israeli strike on a Syrian-held section of the Golan Heights. The number of missiles launched in that cross-border attack is not specified and the fact that there are numerous rural communities in the area in which they landed is not clarified. No effort is made to explain to audiences the wider significance of a missile attack on Israeli civilian targets launched from a section of territory still under the control of the Iranian-backed Syrian regime which, in theory at least, lies within a demilitarised zone supposedly administered by the UN. The report continues with downplaying of the PIJ’s Iranian backing. “Israel’s military has accused Palestinian militants from the Islamic Jihad group of firing the rockets, who Prime Minister Benjamin Netanyahu said Iran had given “sponsorship and instruction” to [sic]. While the Israelis said five or six militants were killed, a Syrian army source, quoted on Syrian state TV, said the strike killed five civilians. One Syrian soldier was earlier reported killed in an Israeli strike on military positions in the Syrian-held section of the Golan Heights. In other words, BBC audiences are encouraged to view a statement aired on Syrian regime-controlled media as being equally plausible to the one concerning Friday’s strike put out by official Israeli sources. Interestingly, the BBC chooses not to communicate to its audiences the information on this topic put out by the Syrian Observatory for Human Rights which is quoted in relation to the subject matter of the earlier part of the article. The Lebanese media organization Al Mayadeen – known to be close to another Iranian proxy, Hizballah – reported that “three of the people killed in the strike were Palestinian” and one Syrian. In addition to being bizarrely placed in an article about another topic altogether, the information provided to BBC audiences on this subject once again fails to adequately enhance their understanding of current developments on the Israel-Syria border. Typical bait and switch. Blame Israel for everything…in line with extremist Muslim theology! why on earth were these stories even conflated ?